So I think I finally made a pretty decent hack! 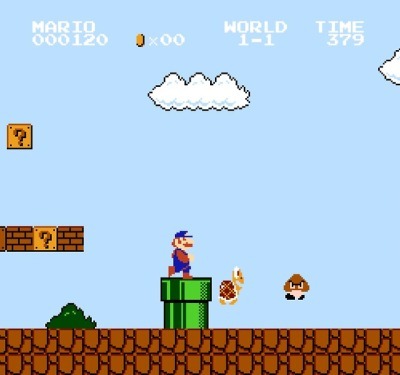 This is for Super Mario Bros.
Lots of speedy enemies are lurking in the background. They can jump out to surprise you at any moment! On top of all: the fireflower is not as strong as it used to be. Re: Super Mario Bros. - Goomba Attack! Goomba Attack has been released. Adds some challenge to the original game with faster, harder, stronger enemies hiding in the background. Also Fire Mario is weaker just to make things more challenging. Seems pretty neat, I'll check it out. 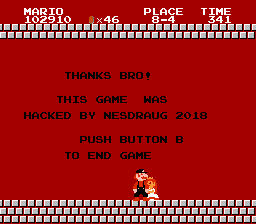 Hello NesDraug, I want to comment that I tried your game, and spend a lot of fun fighting against the immortal Goombas, it reminded me of the sensation that causes the anti-stress bubbles to burst, although I miss having something to kick against them, those bastards fled very fast , on the other hand as constructive criticism I think it would be much more challenging if the amount of mushrooms in the levels were diminished, also as a personal whim I would love that the alterations of the music were optional, the truth is so accustomed to the original compositions that I the new version is strange, although I think I can live with that, and finally nothing but congratulate you! Seems that this hack was only changed through SMB Remodeler, nothing else (other than the music which, well, isn't "original" in tone either)? Hope I don't sound too harsh, but it could have been far more interesting to my tastes if the levels were changed to compensate with the changed "physics". it could have been far more interesting to my tastes if the levels were changed to compensate with the changed "physics". do believe there's a charm in playing the original levels with these new physics and graphics. In lack of new levels there's at least a level selector. This is the second hack I've ever done and in the future it's possible that I'll make another version with new levels. I miss having something to kick against them, those bastards fled very fast , on the other hand as constructive criticism I think it would be much more challenging if the amount of mushrooms in the levels were diminished, also as a personal whim I would love that the alterations of the music were optional, the truth is so accustomed to the original compositions that I the new version is strange, although I think I can live with that. Thank you for you constructive criticism and I'm happy to hear that you liked it. Yes, some shells to kick around would be nice, I agree. Perhaps I'll find a way to make Goombas immortal but the other enemies normal. I descided to get rid of stars in favor of more mushrooms so it would be easier to get the new weak fire flower since it's pretty funny. On the other hand, I think that this hack delivers a sufficiently differentiated experience of the original game, so it is perfectly valid to consider it in itself as a complete work. So although I find the feedback very valuable and especially I think it's great that someone believes in your work enough to encourage you to propose bigger goals, I also think that it is always important that you set your own mints taking into account your goals. Since if the purpose was to meet an unmet demand from a certain sector, let me remind you that there are hundreds of good hacks of levels of "Super Mario Bros." which are perfectly compatible with this work. I just tried the hack and it's a nice alternative experience, but I ran into what I assume is a bug. I rushed through the game and managed to get a game over. Once I got back to the main menu I tried to use the new option(level select), but it didn't work and I could no longer start a game either. The game was stuck on the main menu and start and select would only restart the demo. It seems this happens frequently as I replicated the issue 3 out of the 4 times I tried. On a different note I felt like World 4 was on the easy side compared to the earlier levels as I could easily avoid all of its dangers while running through the levels for the first time. You might want to tweak the enemy numbers or placements there. Yes, I’ve noticed the Game Over bug. Unfortunately there’s nothing I can do about it. For somekind of reason the "in between level black screens" are too fast, that's probably what's messing things up. I consider it a minor glitch. If it’s game over you’ll simply have to reset the game. I did manage to make world 4-1 a lot more challenging tho! Introducing ”Sniper Lakitu” throwing spiny eggs like a mad man! In lack of new levels there's at least a level selector. I was kind of let down when I thought you can select the sublevels according to your wording, turns out it's just the world numbers... Since I have yet to see a single hack which allows you to select both the world and level number. There's plenty of hacks out there which allows world selection from the very start, so this isn't new at all. Never said it was new, mate. Sorry for getting your hopes up. Guess I should have called it world selector (or "place selector" since I descided to rename worlds into places... for no reason). Okay so I've revisited this hack. It was one of my first attempts and it did have some flaws. I'm thinking of releasing a version 1.3. - You can now stomp bouncing enemies and kick them! Warp zones are pretty redundant since this hack comes with a world selector. So I decided to do something fun with them.